Located in the heart of Downtown Hammond, Cena; is an upscale, Italian restaurant serving traditional dishes in contemporary fashion. Inspired by the abundance of fresh, local produce and the ways of old, Cena; is creating a unique dining experience. Originally from New Orleans, Head Chef Alex Diaz certainly has experienced the restaurant scene and food culture of South Louisiana first hand. Alex is a classically trained chef that has an incredibly versatile skill set. He has found success at a number of notable New Orleans establishments and has expanded his knowledge of different cuisines in the process. With local roots and a passion for using fresh, local ingredients in his dishes, as owner and operator of Cena; Chanc Kinchen said, “Alex was the only guy for the job”. 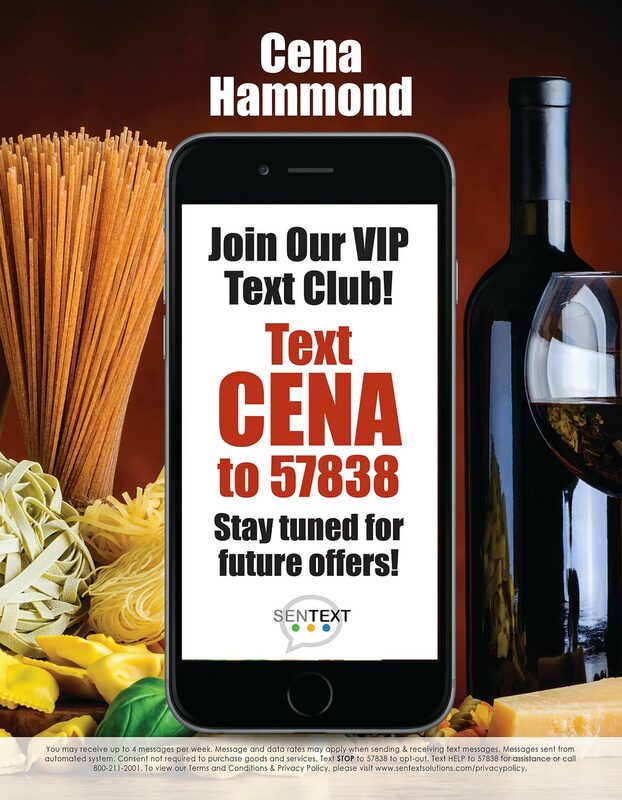 As owner and operator of Cena; Hammond, I've spent 20+ years in the restaurant business and have taken inspiration from a multitude of sources and put them into, what I consider to be, the ideal establishment. As a Hammond native, I still have a strong attachment to the community in which I was raised. My goal is to use local ingredients and delicious recipes to create an exceptional dining experience, while also providing a fresh and inclusive atmosphere that can be enjoyed by everyone. Salute!